This jewelry box features a sleek, contemporary design, with a sturdy construction, and a size of 12.00″L x 6.70″W x 12.75″H when it is closed. It has a beautiful, elegant, black leather finish, which contributes to getting a more sophisticated look of this jewelry case. In addition, it has a hand-lined interior, in ivory suede fabric. This protects your jewelry and accessories, whilst also giving an exquisite background for your stored valuables. Jewelry and accessories are a wonderful symbol for style, fashion and elegance. As a woman, or as a jewelry store owner, you know this, and you also know that it requires a lot of attention and care, protection against the dust, scratches and other damage. So if you want to keep your jewelry and accessories well-organized and safe, then you need to have this amazing Kendal Huge Leather Jewelry Box. The top lid of this jewelry box has a large beveled glass mirror inside. The top of this box is removable, and it has two compartments with a size of 7.25”L x 2.625”W x 1.125” H, and a compartment with three suede lined slots for rings. 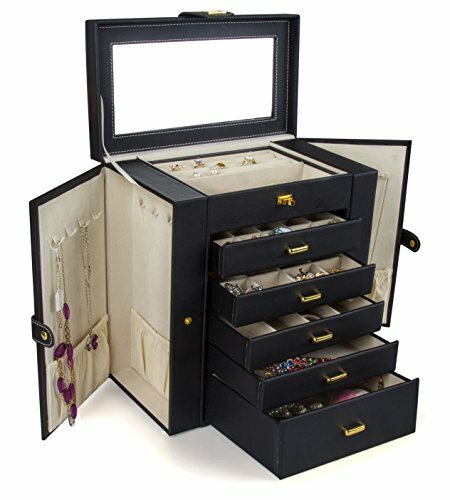 Besides the top of this box, there are five removable drawers, which allow you to find a perfect storing place for all of your bracelets, earrings, rings, watches, and much more. The bottom drawer only has a single compartment that measures 7.31″L x 5.81″W x 2.25″H. The other four drawers are of equal size, of 7.31″L x 5.81″W x 1.00″H each. There are also two swing out cabinets, which are complemented with eight hooks and two storing ledges, which are perfect for hanging necklaces, bracelets, scarves, and others alike. It measures 12.00″L x 6.70″W x 12.75″H when closed. The removable top section has 2 compartments, each size is 7.25″L x 2.625″W x 1.125″ H, and one compartment has 3 suede lined ring slots. 5 removable drawers for maximum jewelry storage. The deeper bottom drawer has only one compartment. Its size is 7.31″L x 5.81″W x 2.25″H. The other 4 drawers are equal size. Their size is 7.31″L x 5.81″W x 1.00″H. Drawer 1 has 20 equal size compartments; Drawer 2 has 12 equal size compartments; Drawer 3 has 4 equal size compartments; Drawer 4 has just one compartment. 2 swing out cabinets, each with 8 necklace hooks and 2 storage ledges. Weight: 8 lbs 10 oz. One year warranty.